About the Author: Annalee Newitz is an American journalist, editor, and author of both fiction and nonfiction. She is the recipient of a Knight Science Journalism Fellowship from MIT, and has written for Popular Science, Wired, and the San Francisco Bay Guardian. She also founded the science fiction website io9 and served as Editor-in-Chief from 2008–2015, and subsequently edited Gizmodo. As of 2016, she is Tech Culture Editor at the technology site Ars Technica. 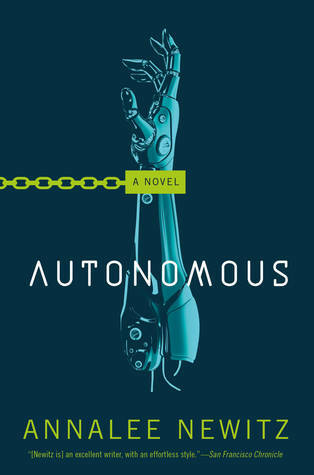 Autonomous is Annalee's first novel. Noteworthy experiences while reading this book: Writing style was great but the story just didn't work for me. Notes and Opinions: I really wanted to like this one but it just didn't work out. I thought the story was interesting and the writing style was fine but the characters were really lacking for me. I didn't connect with any of them and I was slightly bored. The next issue was the world building we don't really get a lot. I wish that we would have been able to really get some much needed history about this world before the story started. As when the story did start it felt like I had been dropped into an already started world. I was so lost and stayed that way for the duration. For me this one just didnt work out at all. The story, chracters, and plot just felt very out of order and I just couldn't get into it.